Connect an additional HDMI display to your Mac or PC with USB 3.0 technology capable of video playback at 1080p. The USB32HDPRO USB 3.0 to HDMI Adapter lets you add an HDMI display to your computer through a USB 3.0 port, providing a cost-effective and convenient way to expand the video capabilities of your Mac or PC computer system.With USB 3.0 support, this external video adapter delivers the bandwidth needed for accelerated High-Definition video performance, capable of outputting video resolutions up to 1920x1200 / 1080p. 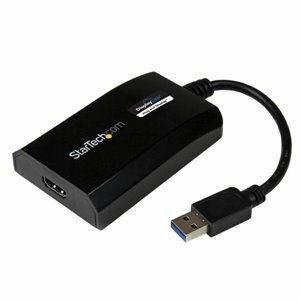 Even if your current computer doesn't have a USB 3.0 port available, the USB32HDPRO is backward compatible with USB 2.0, so you'll be able to connect your HDMI monitor to your computer and be ready for when you upgrade to a USB 3.0-equipped system.Add the screen space you need to simplify multitasking and maximize productivity, without even opening your computer case. Some computer systems, including MacBook and Ultrabook laptops and small form-factor desktops, are too compact to install an internal video card. A USB display adapter offers an easy workaround, performing as an external video card that only requires an available USB port to mirror or extend your desktop onto another display.Installation has never been easier. When you connect this DisplayLink Plug and Display certified adapter to a web-enabled Windows 10, Windows 8 or Windows 7 computer, it automatically downloads and installs the most up-to-date drivers for you, so you won't have to manually download or install any software. With USB 3.0 support, this external video adapter delivers the bandwidth needed for accelerated High-Definition video performance, capable of outputting video resolutions up to 1920x1200 / 1080p. Add the screen space you need to simplify multitasking and maximize productivity, without even opening your computer case. A USB display adapter offers an easy workaround, performing as an external video card that only requires an available USB port to mirror or extend your desktop onto another display. Installation has never been easier. When you connect this DisplayLink Plug and Display certified adapter to a web-enabled Windows® 10, Windows® 8 or Windows® 7 computer, it automatically downloads and installs the most up-to-date drivers for you, so you won’t have to manually download or install any software.